Horse owners and product reviewers alike praise the Alzoo collar for its extraordinary efficacy to repel insects for three full weeks — with all-natural herbal ingredients! For example, at Intelligent Horsecare they’ve said, “We have used these collars for several years now and find them to be 80-90% effective, which is the same comparable effectiveness as some of the most expensive natural spray-on fly repellents.” And without the spray-on drawbacks! (Read the whole review here.). Horses like it, insects won’t. Here’s the natural way to give your horse significant relief from warm-weather pests. Comfortably secured, it keeps releasing its natural aroma -- even when wet -- for at least 3 weeks. A pleasurable alternative to irritating, short-lived sprays and other topical applications. Over time, the active ingredients migrate over the animal’s body, forming an evaporative “halo” of protection around horse and rider -- without discouraging social grooming. There’s nothing to “maintain.” Just fasten it, forget it, and find freedom from so many pests. The Alzoo collar works for at least three weeks, and its effectiveness won’t be washed away by rain or sweat. The secret is in the encapsulation technology of the collar’s special polymer material. It’s a “smart plastic.” The ingredients are bonded within the entire collar’s molecular structure, for slow release over time. This controlled-release effectiveness lasts 3 full weeks. No maintenance, nothing to add, nothing in the way. Just loosely fasten it and enjoy major relief from annoying insect pests, continuously. Q: What are the active herbal ingredients? A: Melaleuca alternifolia leaf oil, lavandin oil, and geraniol – all are natural herbal essential oils. Q: How do I know collar is still working? A: Observe your horse. Its ingredient release rate is unaffected by sweat and water, but is increased by heat. Tests have indicated that it can be effective for up to 4-5 weeks, but because temperature conditions vary greatly worldwide, we conservatively estimate at least 3 weeks after the package is opened. To assist in quality control, each package carries a lot number. Shelf life of the unopened package is three years. A: The product is double-sealed to preserve its repellent qualities. We suggest using strong scissors or a utility knife on a firm, stable surface. Q: What insects does the Alzoo Herbal Collar for Horses protect against? A: It is effective against flies, mosquitos, horseflies, gadflies, midges. Users and editorial reviewers have stated that it also discourages ticks, but we have not tested against those. Independent tests have verified its efficacy in controlling flies. Q: Does water reduce the collar’s effectiveness? A: No. The collar is impervious to water and is resistant to the horse’s sweat. When exposed to air, it releases its effective ingredients in a controlled manner. The active ingredient migrates over the entire body of the horse, and by evaporation it forms a halo that protects both the horse and rider. Flowing water (as from a hose) can partly “wash away” the migration effect, which resumes once the flow of water stops. Q: Is the collar 100% effective? A: No repellent is 100% effective, and the effect will be greater nearer the collar. The collar is therefore particularly effective around the face and eyes. Q: You say the ingredients “migrate” after released from the collar. How do they taste to other horses in social grooming? A: Topical sprays and liquids can be distasteful to horses. But with our collar’s essential herbal oils, there appears to be no inhibition to social grooming. Q: How does the collar fasten? A: Place the collar around the neck of the horse as a throatlatch and about 4” down from the Poll. Adjust the collar for a snug fit but do not overtighten. Allow for two holes in the collar as an overlap. Line the holes up, take one of the four plastic rivets and push it through the first overlap hole from the reverse side, take another rivet, line up the prongs so that they fit into the spaces of each other and squeeze together to make a firm connection against the collar. Repeat the process in the other overlap hole. Clip off any extra portion of the collar and save for use in the stall to provide added protection. The collar is designed to come apart safely if the horse gets snagged on a fence or tree. 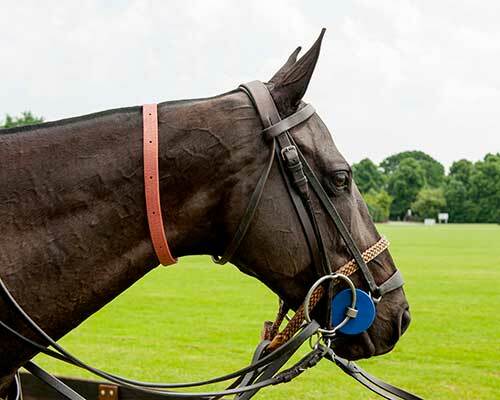 Q: Where can I get the Alzoo Herbal Collar for Horses? A: It’s carried by tack shops and various other retailers in many countries. If not available near you, reach out to us through our "contact us" form, and we’ll let you know how to obtain it. Q: Can I buy it online? Alzoo products are manufactured in France by AB7 Industries, a specialist in biotechnology since 1972. The exclusive BornWith® molecular formation that makes the Alzoo Herbal Collar for Horses so effective and long-lasting was developed in AB7’s own state-of-the-art laboratory and manufacturing facilities. The Alzoo Herbal Collar for Horses is marketed in various countries by Hackamore Inc. Hackamore is also the exclusive U.S. importer of AB7 Industries’ Dr. Rechell products for people, featuring the Dr. Rechell mosquito-repellent bracelet. To learn about and Hackamore Inc. and Alzoo marketing opportunities, contact us and click for this Product Profile. * indicates required. We'll keep your email and other information to ourselves. I am a marketer (retailer, sales rep, etc.). Photography, David L. Justis, M.D., Ph.D.